(2018-10-06, 20:22)Harro Wrote: You are using 1 parity drive for the 74 TB? What speeds are you getting on a parity check and how long does it take? With how FlexRAID works, it only needs to generate new parity with new or altered files. So every week the parity check can take an hour to a few hours, or 6-12 hours if I've made HUGE changes. (Usually a very large ingestion, like nearly a TB in a week, but that's rare). However, to build all new parity data from SCRATCH, it will take multiple days to generate it. Also, since this is a file based, snap shot, parity system. Even if one storage drive and one parity drive blows up, all the other drives still just have NTFS file systems, all the files, plus some folders of special meta data. Any surviving drive can just be pulled out and read normally in any system that can read NTFS. Thanks for the info. I have wanted to dabble with Flexraid but Unraid just seems to get better and better. Have you ever considered trying Unraid? I currently have been running Unraid for many years and I like it a lot. My sig has my build but since then I have updated the PSU and CPU, along with all hard drives. Currently at 104TB of storage with 2 parity drives. My parity check monthly takes about 18 hours. Upgraded the cpu so I could run a Plex server and stream more clients on the server. Psu was upgraded because of the higher power for the 7200 rpm drives. I idle at about 100watts and have the server connected to a battery backup in case or power failure. It is fun to have storage for whatever needs you want. (2018-10-07, 20:49)Harro Wrote: Thanks for the info. I have wanted to dabble with Flexraid but Unraid just seems to get better and better. Have you ever considered trying Unraid? I currently have been running Unraid for many years and I like it a lot. My sig has my build but since then I have updated the PSU and CPU, along with all hard drives. Currently at 104TB of storage with 2 parity drives. My parity check monthly takes about 18 hours. 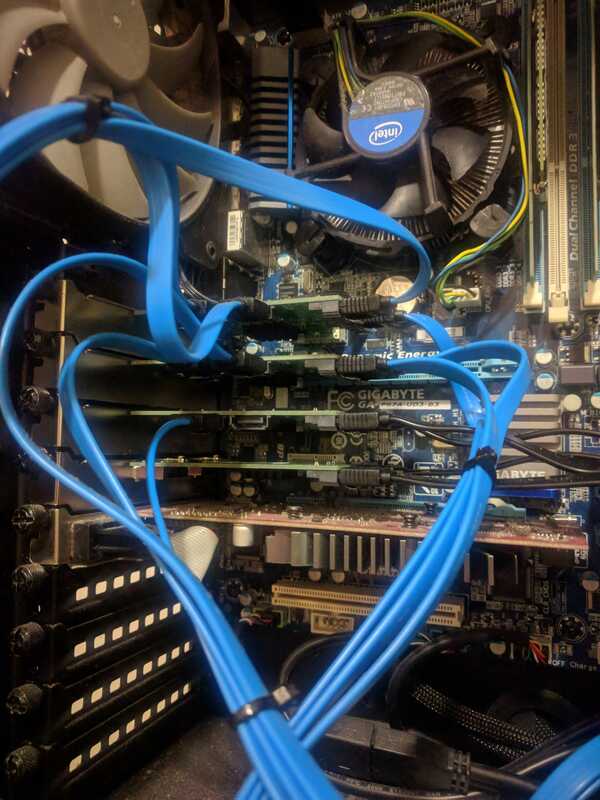 Upgraded the cpu so I could run a Plex server and stream more clients on the server. Psu was upgraded because of the higher power for the 7200 rpm drives. I idle at about 100watts and have the server connected to a battery backup in case or power failure. Unraid is pretty attractive and I didn't really know about it when I went with FlexRAID. I was mostly looking for a replacement for DriveBender at the time. 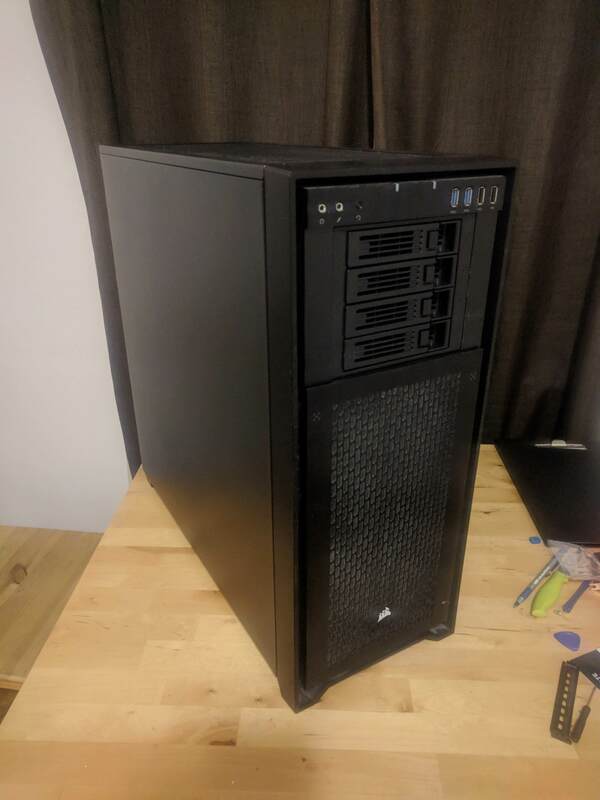 I eventually will deploy a SECOND server to supplement this one, once it's hard drive capacity is maxed out, and I'll seriously look at UnRAID in that situation. A few more upgrades! eBay had a sale on 8TBs so I added another, we're up to 78TB of storage now. I added the last SATA card it'll need and then I installed a hotswap bay to allow me to install 4x3.5" drives in the 3x5.25" bays. With this, the server will now hold 16x3.5" drives, plus 4x2.5" drives on the back side trays. 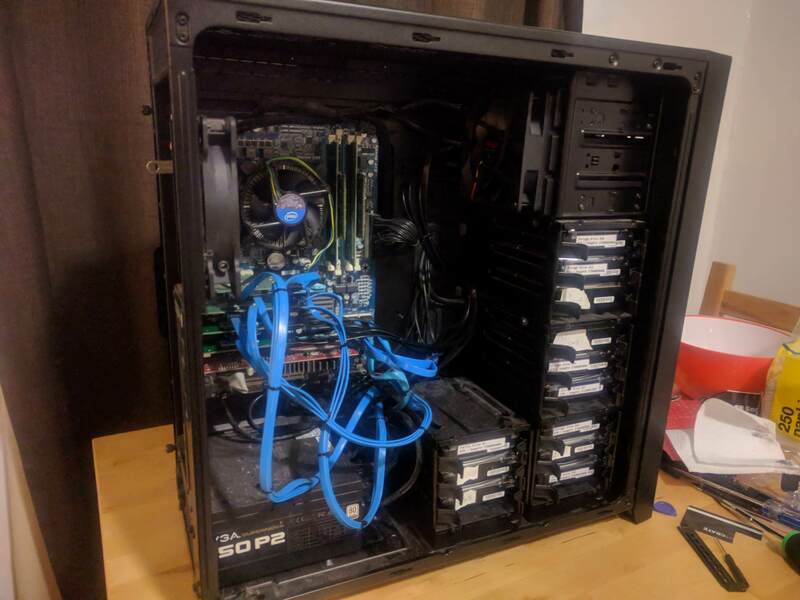 Once this is full, it'll be time to build another server. The next one will be a 4U rack unit and use LSI drives and otherwise have a LOT more forward thought.